Converters, PLC's, HMI's etc. 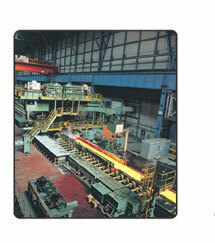 for modernisation of an aluminium foil rolling mill at Yennora, NSW. In 1998 at BHP Western Port, Victoria, Toshiba carried out a completed re-automation of the hot strip mill including the installation and commissioning 24 sets of converters up to 6000 HP, various inverters, a PLC control system, and modelling & supervisory computers.